The osteoarthritis in Betty’s hands got worse every year. Her hands had become so stiff and painful that picking up her cup of coffee in the morning was becoming difficult. It was so bad that when a distributor came to her door selling magnetic bracelets to cure arthritis, she bought one without even questioning if there was any scientific evidence behind the claims. At that point she was willing to try anything that promised pain relief. 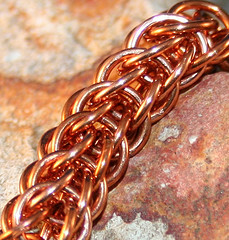 Magnetic and copper bracelets have become popular products used by many to manage the pain of chronic musculoskeletal issues, such as osteoarthritis. In fact, worldwide sales of therapeutic devices incorporating permanent magnets is estimated at $4 billion. But do they really work? Well a study coming out of the University of York is raising some doubts on the effectiveness of magnetic and copper therapy. Researchers in the Department of Health Sciences at the University of York performed a randomized, controlled study that involved 45 individuals who were diagnosed with osteoarthritis. During the 16 week study, each participant wore four devices in random order: two wrist straps with differing levels of magnetism, a demagnetized wrist strap and a copper bracelet. At the end of the trial, no significant difference was seen between the different bracelets in relation to treating pain, stiffness or function. Essentially, the study concluded that wearing a placebo wrist strap was just as effective as wearing a strap that had copper or magnets in it. This study claims that the pain relief people claim wearing copper and magnetic wrist straps brings may merely be a placebo effect. Sometimes, believing that something will work, will actually make someone feel better. Also, it may be that magnets are employed when pain is at its worst. Then when the pain eases for other reasons, the benefit is incorrectly attributed to the copper or magnets. So, you might not want to spend a lot of money on magnetic or copper products. If it is a placebo that you are buying, a cheap one will do just as well.